Hello there! Welcome chez moi! But since I promised you there would be an article every Friday, this will short one will be the perfect way to keep my promise. 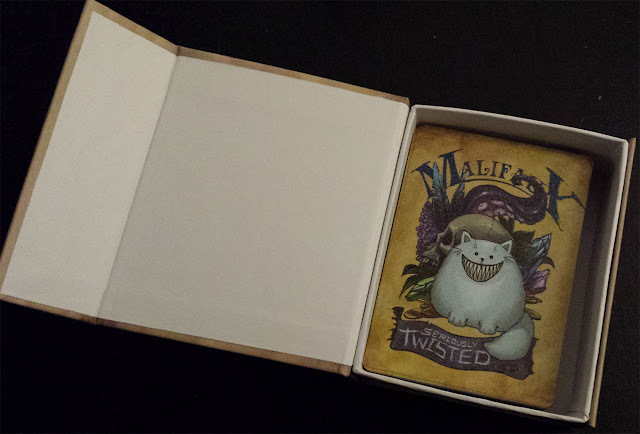 So, this will a little unboxing of the "Twisted Fate Deck" for Malifaux. Eversince I started playing Malifaux -- waaaay back with 1st Edition, that was seven years ago -- I've developped a weird addiction (see what I did here? Nudge, nudge, wink, wink!) to Fate Decks. At some point last year Wyrd Games published a new series of Fate Decks. The first one which caught my eye was this nice one, with a smiling cat on the cover (you've got to admit that the Cheshire Cat from Alice in Wonderland is one of the coolest character there ever was in all of literature!!! And you can't help noticing how strong the influence of Lewis Caroll's tale has been on Malifaux's background...). So, although at first, I was trying to remain reasonable, I couldn't resist very long and bought it. It comes in a nice little cardbox, with the "Malifaux Twisted" logo on the front. It's a clever, solid cardbox which opens on the side as if it was a closed folded book. One of the cardboard panels has a magnet inside and so, it closes perfectly and stays closed, even in your case, when you're taking your games outside. 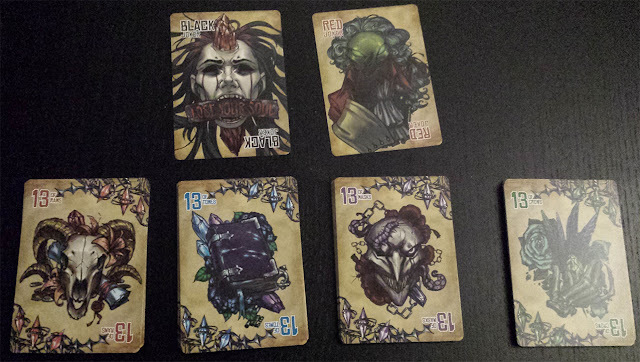 The 54 cards themselves are the usual plastic Wyrd Games uses nowadays. At first (it was with the Retro Fate Deck) I have to admit I wasn't too fond of it. It's a bit slippery and I tended to fumble the cards all across the table whenever I shuffled them... But then after a while, if you use them, they get the perfect feel and lose their slippery quality. And this is exactly the same with the cards from this Fate Deck. And for Malifaux specifity, you can find in two opposing corners the level of severity for the damages. On Wyrd's usual Fate Decks, they're usually represented by dots. Here, you can find three gems (soulstones?). Some are white, and you just have to count which are coloured to find the level of damage they represent : one coloured stone : Weak, two is Moderate, and three is Severe. They are intertwined with some sort of barbwire, which makes for a killer look. Both Jokers are easily identifiable : the Red Joker shows Lucius Matheson's mask and twig, with a rather creepy mood for such a yet welcome sight when you play. The Black Joker is also unmistakable : a cadaver's face, with empty eye-sockets, crying blood, a huge sousltone going right through the poor soul's head, his mouth open, sporting a scroll with "Lose your soul" scribbled on it. They told you bad things happen in Malifaux! The back of the cards sport the Malifaux Twisted logo with the weird smiling cat, which is perfect for me, since it was the artwork that got me into buying the deck. All in all, this product is quite good. 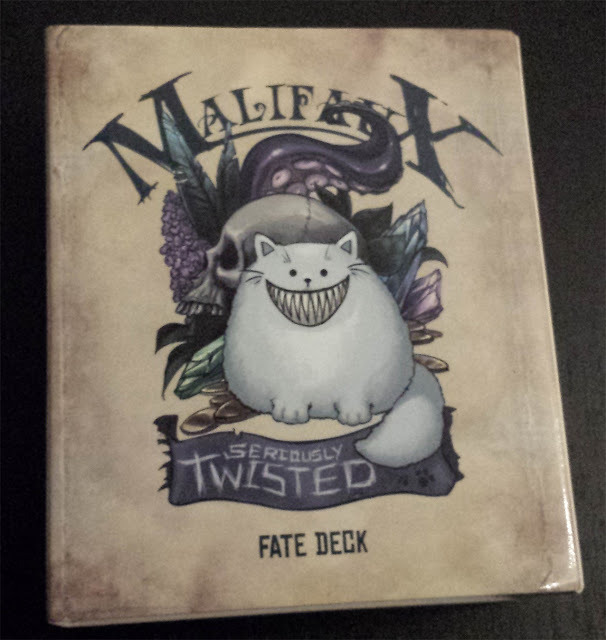 If it's not an essential buy (you can play Malifaux with a cheap poker deck), but it's sooooo classy to take it out of the box and play your game with it, that, as far as I am concerned -- and if big, cartoon-looking smiling cats are your thing -- makes it a nice touch to your games. Well, that's it for today, see you around next Friday!